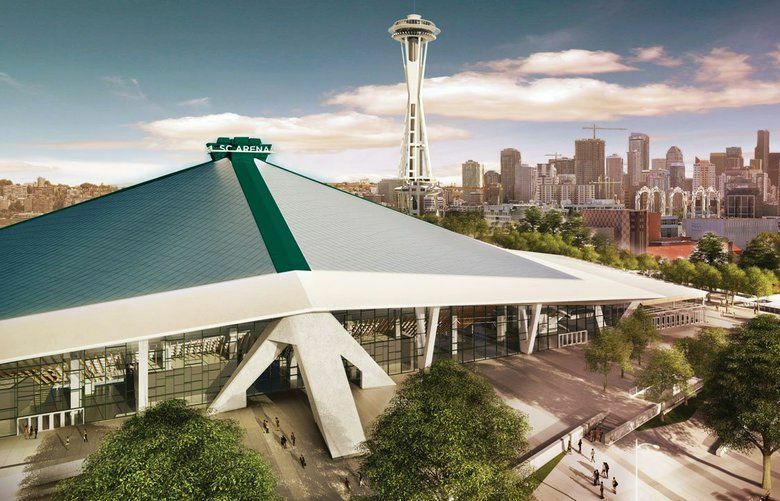 Brothers Tod and Tim Leiweke have given about every reassurance possible that they want the NBA back in Seattle, but first must prepare for the coming NHL team, whose fans have paid season-ticket deposits but seem to be set on the back burner for now. The Leiweke brothers, Tim and Tod, dropped an eye-opening tidbit last week that 40 percent of season-ticket deposits for Seattle’s future National Hockey League team came from people living within four miles of KeyArena. It’s another indicator of Seattle’s changing demographics and that what we thought we knew about the NHL fan base was vastly underestimated. Almost nobody envisioned 33,000 season-ticket deposits within 31 hours and a waiting list of 4,000. Now, we’re told a huge percentage of those deposits came not from far-flung areas, but the very heart of this changing city. So it’s time those fans got the attention and respect their size deserves, especially with an NHL franchise looming. Instead, much of the city’s arena discussion still treats hockey supporters as an afterthought and is spent constantly reassuring a segment of local NBA fans they haven’t been duped. Look, we all know what the Sonics meant for four decades before being uprooted to Oklahoma City in 2008. Nobody is criticizing basketball fans worried the NBA might never return. But the discussion needs to move forward. Whether it’s NHL Seattle president Tod Leiweke insisting at every speaking engagement that the NBA remains a priority, or Oak View Group CEO Tim Leiweke touting portions of a $700 million KeyArena remodel being devoted to basketball purposes, they’ve given just about every reassurance possible. Those reassurances continued at last week’s news conference announcing the KeyArena renovation’s general contractor. The Leiwekes and partners showed off new renderings of arena designs for basketball, talked about the venue’s NBA capacity increasing to 18,600 and of a separate dressing room being built for a future Sonics team. NBA fans have increasingly warmed to their approaches and some eagerly await the remodeled facility. But others will never be satisfied unless guaranteed an NBA team. And that can’t happen until the NBA expands or relocates. Eventually, the Leiwekes will have to stop trying to win over this contingent and focus more on the still-developing NHL fan base. They can’t placate the angst of every Sonics fan, nor prevent others from sowing further seeds of doubt. Soon after last week’s news conference, a paragraph in a wide-ranging ESPN.com story on expansion plans of multiple professional sports leagues took a swipe at Seattle’s NBA hopes. The paragraph wasn’t attributed to any source, but predictably set the internet ablaze on how our city has blown its NBA chance. Nobody I’ve spoken to within the NBA or its head office since would corroborate the league prefers the Sodo plan of entrepreneur Chris Hansen. How should antsy Sonics fans react? Well, I’d suggest considering some facts. Tim Leiweke helped build arenas meeting NBA revenue requirements in Minneapolis, Denver and Los Angeles. Later, with encouragement from current NBA commissioner Adam Silver — who he’d partnered with on NBA-compatible arenas in Shanghai and Beijing — Leiweke ran the Raptors franchise in Toronto. In a conversation with Silver last fall, I asked him whether Leiweke could make KeyArena a venue his league would play in. I also asked Silver to characterize his relationship with Leiweke. Lakers owner Jeanie Buss and Warriors president Rick Welts gave similar on-the-record assurances about Leiweke, whose current partners include New York Knicks owner James Dolan and Boston Celtics minority owner David Bonderman. The Seattle City Council votes next month on green-lighting KeyArena construction. If the NBA truly doesn’t want KeyArena, does anyone believe Silver – who has conversed for years with city officials and the Leiwekes – wouldn’t speak up and advise his own friends, business associates and NBA owners against sinking their private money into that project? Or that the city, hearing from Silver he prefers Sodo, wouldn’t revisit that proposal? But none of that is happening. Instead, KeyArena steams forward with another $100 million in private money committed. In a conversation after the ESPN story appeared, Tim Leiweke dismissed the notion he can’t please the NBA. His pitch is that instead of an NBA owner spending between $800 million and $1 billion building a new arena, they can walk into a revamped KeyArena and immediately reap contractually protected revenue from naming rights, sponsorships, luxury suites, concessions and merchandising. Regardless of the NHL coming first, he added, all contracts include provisions protecting future revenue for any NBA team. Logic and facts agree. But again, until the NBA expands or relocates here, there’s no way to definitively prove anything. Meanwhile, local NHL fans await answers about the cost of season tickets they made deposits on months ago. And about the expected hockey team’s name, colors, practice facility, general manager, coach and expansion-draft plans. These hockey fans appear a major part of our newly emerging city and not the second-tier arena patrons they’ve too often been portrayed as during this yearslong saga. The NBA queries have been asked and answered, with nobody contradicting the replies on the record. It’s high time more energy is focused on answering and placating the NHL fans we’ll soon be counting on to carry the winter-sports load for this market.